Around a year ago Nicole Richie promised we'd see handbags added to her House of Harlow 1960 line, and she's finally making good. Her debut purse collection will hit stores this fall. Just like the jewelry, over-sized sunglasses, apparel, and footwear that House of Harlow 1960 is known for, the handbags will have a vintage, bohemian feel to them. We're promised something to carry during the day and once the sun goes down, with large leather bags, small framed purses, and structured box minaudieres. 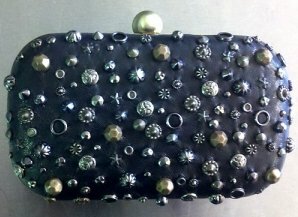 I'm particularly fond of the various studs and metal charms dotting the whimsical box minaudiere purse pictured. Softly draped vintage leathers will be given a contemporary lift with luxurious skins, including hair calf. Look for Richie decorating the pony with leopard prints and perforated laser cuts. Given the luxury materials Nicole Richie favors I'm impressed at her range's approachable price points. The crocodile printed box clutch is the most affordable item at $150, but even the opulent leather and laser-cut pony hobo will only cost $625. I'm not saying that's small change, but it's also not likely to max out credit cards. Look for Nicole Richie’s new House of Harlow 1960 purses in selected retailers this fall.